The girl is the ghost who haunts the House of Bad Grades, according to the Lawndale legend recounted by Jane Lane in the episode Legends of the Mall. Legend has it that during the 1950's, a suburban family with two daughters (portrayed by the Morgendorffers in Jane's retelling), had built a fallout shelter in their backyard in case of a nuclear attack. 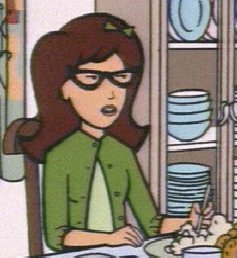 The intelligent daughter (represented by a '50's version of Daria) planned on escaping the tedium of life in 1950s Lawndale by applying to college, but received little help from her family. Unable to complete her college application due to the noise in the house - her requests for quiet had been ignored - she fled to the bomb shelter to complete the application, but fell asleep. While she slept in the shelter, her family, realizing how unlikely a nuclear attack was, decided to convert the bomb shelter into a new barbecue pit. They poured concrete over its entrance, failing to realize that they had inadvertently entombed their missing daughter. When her family noticed she was missing, they assumed that she had run away to become a beatnik. Her undead spirit decided that if she couldn't leave the house to go to college, then no one would. An invisible hand is seen changing the homework answers of a resident student, condemning him to perpetual academic underachievement. The ghost gives an extremely sneery laugh to herself over this, and taunts the kids. Daria was clearly skeptical of the story after hearing of it ("Scoff. "), but Jane claims every kid who ever lived there is still living in Lawndale today working minimum wage. In Daria: The Complete Animated Series, we can read how she vandalised one essay ("£Why did William Jennings Bryan say that "Man should not be crucified on a cross of gold"? "), with: "William Jennings Bryan probly [sic] didn't like to see people get crucified at all 'cause you know it's very painful what with the nails and the hanging in the saw and stuff and doing it in a cross made of gold only made it worse because what a waste of gold that could be made into chains or other jewelry or something. What time's lunch?"